A few I've put up here. 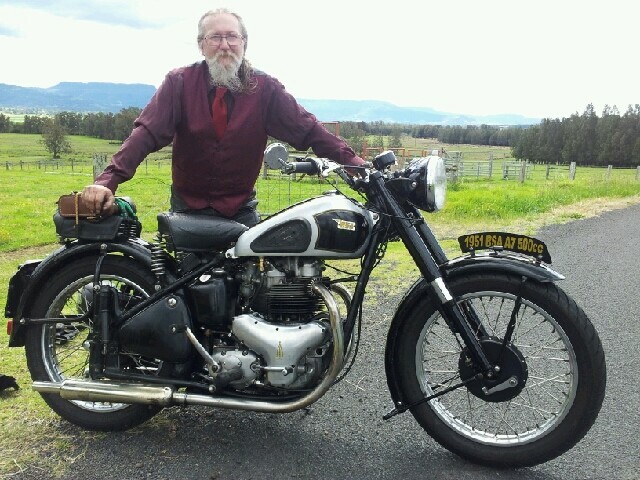 The first is our most respected member Tom who at the age of 91 still does all the rides and just bought his first NEW motorcycle. The Black Prince won Bike of the Show. Good turnout and some darned nice bikes. It was a brilliant day, sunny, calm and 20C. We were worried that the newly finished Berry bypass would slow things down but we ended up with the 2nd best show on record (153 entries in '14). I wore my Forum tee all day, Tim popped in but couldn't find me. Only two A10's there, my '57 Cafe and Denny's '62 BVSR. Many people comment that most shows these days are all HD, they like our show for it's wide variety of bikes. So now I start collecting parts to make next years trophies. Love the Jack Russell's full patch. Thanks Musky... I always enjoy looking at your clubs pictures, GREAT SHOW..
Just an update on the Show. $3000.00 was raised on the day. Lions Club also benefited by doing the sausage sizzle. Ps: One of our (SCMC) members asked why we donate the money raised? I said "It makes us feel good"
Can't figure out which bikes are yours. The second post of pictures in the 2nd and 3rd pic there's a red arrow pointing to my little AG175 and the Cafe.